The US Federal Governments owns nearly 650 million acres of land - almost 30 percent of the land area of the United States. These are lands that are held for all Americans. Up until now, there has been no quick & easy way to retrieve the boundaries of these properties without carrying physical maps, books, or slowly digging deep online. 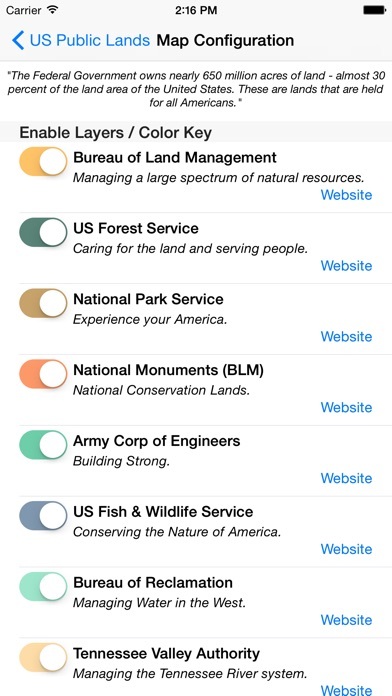 Included in this app are on device (fully works offline), individually selectable & beautifully colored layers for all of the properties administered by the federal government that are more than 640 acres in size: - Bureau of Land Management (BLM) - US Forest Service (FS) - National Park Service (NPS) - BLM - National Monuments - Army Corp of Engineers (ACOE) - US Fish & Wildlife Service - Bureau of Reclamation - Tennessee Valley Authority - Department of Defense (military bases & installations) - Other (National Laboratories, Test Sites, etc...) Key Benefits & Features - Know which US agency owns and operates the land you're on or are heading to. Use the "Layers" icon to select which agencies you want displayed to create your own custom map. (Hint, the toggles are color coded to the color each layer is displayed in.) - Links are provided to each agency's website within the app, so that you can further your research as to what land use rules apply for each public land type - such as permits, fees, activities allowed, and limits of stay. - Map layers are stored on device - no internet connection required. - Be sure to turn on the 'Basic' base map to see the US Public Land labels for each land area. This base map layer is also stored entirely on your device, and can be utilized if you do not have an internet connection or would like to conserve bandwidth. - If you have an internet connection, you can utilize standard and satellite view maps as well as the base layer underneath the public land overlays. - A boondocker's assistant - by turning on the Satellite view map, you can better scout out trails, roads and boondock camping locations within the boundaries of the public land resources. (Please note, this is not specifically a campground locator app - but you can combine the boundary maps with satellite imagery to scout out where there are clearings and signs of dispersed campsites. For an example of how this app can help with finding boondocking locations, see: http://www.technomadia.com/2014/09/finding-magical-boondocking/) - Quickly toggle between 'Show' and 'Hide' via the "Map" icon to more clearly see satellite images below. - If you have GPS access on your device, click the 'Locate Me' icon to show your present location - know what type of land you're on right now! - Built in search tool locates anything on device maps supports (requires internet access) - including cities, states, zip codes, addresses and points of interest. A pin is dropped at the search location. 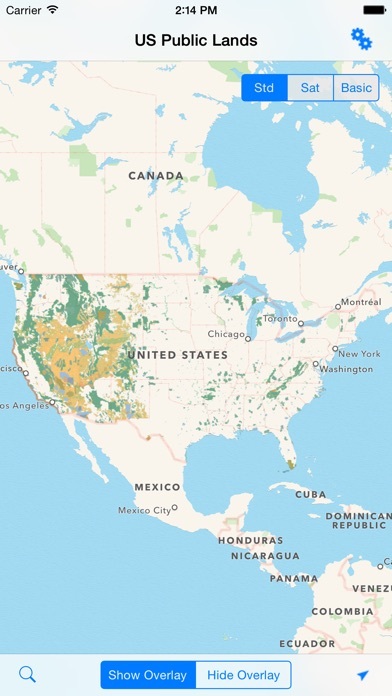 Now the US Public Land boundaries can be in your pocket! Thank you to the National Atlas of the United States for providing public domain raw map data that we’ve been able to apply our proprietary rendering technology to create an interactive overlayable mapping & navigation tool. We will update our maps, when they update they theirs. Please note, the National Atlas maps only report to the nearest 640 acres (or about a square mile). This is obviously not detailed enough to be precise around borders, or for determining where private inholdings within public lands are located. 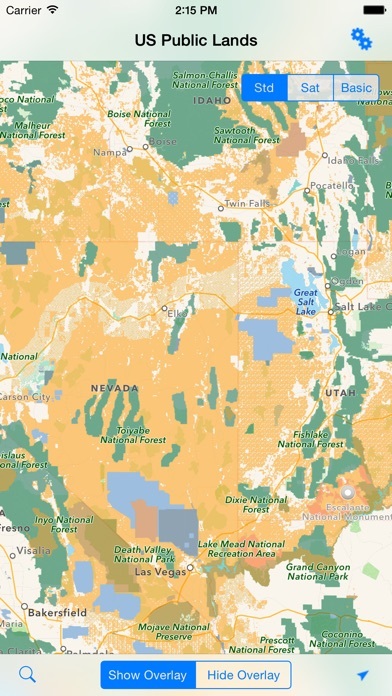 US Public Lands should only be used as an overview, and you should always confirm more precise details by consulting more detailed maps, local field offices or the websites links within the app. And we of course can make no guarantees as to the accuracy of the maps provided by the National Atlas. It does does what it says it will do. I’m a boondocker and this helps me determine if I’m on federal land and what agency owns it. Used in conjunction with a camping app such as UC, you’ll be all set to head out into the wide open spaces. Comparing this to a BLM map the overlay does not match. This is specifically for East Imperial County. 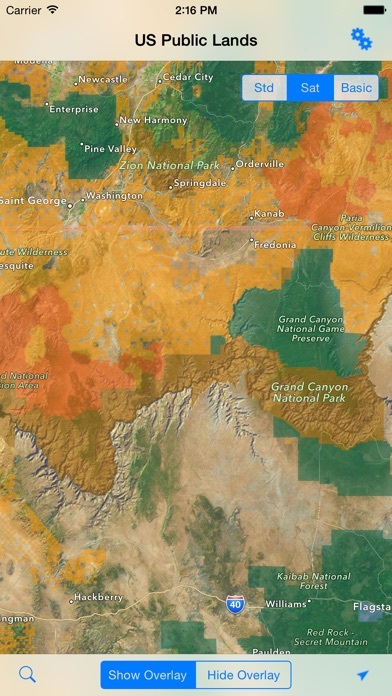 (BTW, it also does not match freecampsites.net public lands overlay, which matches the BLM map.) The overlay itself seems to be accurate. The problem is that is not in the correct location. I’ll continue to test it in other areas, but for now I’m skeptical about US Pubilc Lands overlay accuracy. Without the overlay the app is useless. So inaccurate it’s basically worthless. Less than two minutes into comparing the maps on this app to actual BLM maps it’s strikingly inaccurate! Hikers and hunters beware, this app could easily put you on private land. One look at neighborhoods in my area and it shows BLM and Forest Service land where there’s entire neighborhoods of private property with .5 to 40+ acre parcels. I want my money back. I paid for this? How is this useful? No resolution worth using on these maps. Download Avenza and use the MVU maps from BLM for real, up to date info about where we can and cannot go and dry camp...for free. Seems that you can only drop pins after you search for a city or place, not wherever you want such as a great camping spot you’ve found, and then the only way to back out of a search is to clear the pins? There should be a way to switch to Apple or Google maps and carry your location with you. Not detailed enough. Lots of BLM spots we’ve found are not marked as BLM. Kind of a shame as this app could be so much better. Worst app ever and absolutely useless! This app is a complete fraud. Nothing on this should be called an app. I want my money back!!! My husband and I love 4-wheeling out to the middle of nowhere and staying a few days. Many times we’ve wondered if we were on BLM land or not. Now we know. I love that it shows your gps location on the map in conjunction with the colored map overlays. (Although I don’t believe it shows the coordinates.) If you’re looking for a basic app that shows if you’re on public land or not, then this is the app for you. If you need something that shows campgrounds and has all the frills, then look elsewhere.